Great Fiat Ducato car Leasing & Contract Hire Deals. Fiat's Ducato might not be the first name on your LCV shortlist, but the latest Euro6-engined model definitely merits your attention. Spun off the same platform as the Peugeot Boxer and the Citroen Relay, the Ducato scores in three key areas; robustness, low running costs and increased cabin sophistication. Our Fiat Ducato Lease Deals. Pounding the streets of Naples or Palermo is about as tough an assignment as you could think to put a commercial vehicle through, but it's here that Fiat's Ducato has earned a loyal following. If it can put up with that sort of traffic, heat-cycling, and punishment from potholes, cobbles and other road users, British conditions aren't going to make it break a sweat. The latest model builds on the toughness of its predecessor and adds a welcome layer of technical sophistication. Fuel economy has been markedly improved and it's impossible to argue with the basic practicality of the Ducato. Perhaps the biggest threat this van has to face down is from its sister vehicles, the Citroen Relay and the Peugeot Boxer. Your buying decision may very well come down to which of these three you can negotiate the best deal on, but do consider the Fiat's better fuel economy before haggling. It's interesting how cultural factors creep into what seem the most pragmatic buying decisions. Take large panel vans as an example. On the face of it, choosing a van is about the least emotional vehicle selection procedure you can imagine. You weigh up the relative merits of each model and one comes out a winner. Yet how is it that in northern Europe, a Ford Transit is so often the result of that process whereas in southern Europe, those cold hard calculations usually equal Fiat Ducato? Clearly dealer proliferation is a factor, but more than that it's trustworthiness. If everybody else buys one, they must be good, right? The Ducato is good. Now in its sixth generation, the Ducato has forged a solid track record. It's notched up 2.6 million sales since it was first launched in 1981, and continues to make big numbers not only in Europe but also in the 80 international regions in which it is on sale. This model nw makes more running cost sense thanks to the addition of cleaner Euro6 engines. 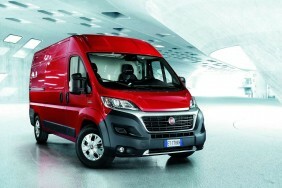 Fiat has established itself as a centre of excellence for diesel engine technology and the Euro6 MultiJet II engines found under the bonnets of the Ducato reinforce that reputation. Most Ducato buyers opt for the entry-level unit, now a 2.0-litre 115bhp Multijet unit that's downsized from its predecessor Euro5 powerplant. Similarly, the flagship engine, previously 3.0-litres in size, is now a 2.3-litre MultiJet II unit, though it still develops 180bhp, the same as before. The core 2.3-litre MultiJet 130 and 150bhp engines continue on from before but get upgraded LPEGR technology to improve their efficiency. As before, all the engines are mated to six-speed, all-synchromesh manual gearboxes and there's also the option of a ComfortMatic transmission. The braking system benefits from effective discs which are ventilated 280mm or 300mm rotors, depending on gross vehicle weight. In recent times, Fiat has added in tougher brake pads and a more powerful brake servo too, along with a redesigned brake pedal that allows for smoother modulation of braking pressures while reducing pedal effort by up to 45 per cent. Mechanically, the Ducato retains its front-wheel drive configuration with a McPherson front suspension and a rigid-axle rear suspension with leaf springs. The front suspension top mounts have been reinforced to reduce noise, with a number of rear suspension configurations on offer depending on vehicle use. Single-leaf springs, with or without anti-roll bars, underpin standard van and passenger versions. Double-leaf springs, again with or without anti-roll bars, cater to large-capacity vans and heavy conversions. A heavy-duty rear suspension with double leaf-springs and an anti-roll bar is available for very heavy conversions up to maximum 2,500kg allowed. The Ducato came in for a fairly extensive refresh when this sixth-generation model was announced in 2014 and it still looks fresh. The front end features large high-mounted headlights incorporating daytime running lights. It also incorporates a smart branded grille as well as a multi-piece front bumper to minimise accident damage and reduce repair costs. The cabin quality has improved significantly inside in recent times, helped by the fact that Fiat has reconfigured the dash to improve ergonomics. The Ducato gets a dual passenger seat incorporating a drop-down desk unit. Up to ten in-cab storage areas are available, including the glovebox, a fascia-mounted document clip and various open or lidded compartments on the dashboard. In addition, there are large door pockets, a storage space beneath the passenger seat and a sizeable 22-litre overhead storage compartment. There's been a clear effort amongst this Ducato's designers not just to improve the perception of quality in the cab but also to beef up high use, high stress items such as the rear doors. Some 11,200 hours of bench tests and over 500,000 door operation cycles were also conducted to effectively simulate more than ten years of heavy use resulting in reinforcements to the key points of the body and door surrounds, as well as redesigns and improvements to the hinges, sliding rollers, stops and door seals. As a consequence, the durability of the vehicle body has been improved by more than 50 percent. The Ducato panel van range opens at around £20,000 excluding VAT. Is that good value? You be the judge. As well as the inherent value of improved fuel economy and lower emissions across the range, you also get plenty of kit fitted as standard. This includes Electronic Stability Control with a hill holder function, electric windows, electrically adjustable and heated mirrors, a 30W Audio system with MP3 playback and USB/AUX ports, Bluetooth, a full-sized spare wheel and a speed block (56/62/70/81 MPH) that can be set in the workshop. Upgrade to the Tecnico model and you'll also get manual air conditioning, a U-Connect DAB Radio with 5"" touchscreen, CD/USB/AUX integrated TomTom satellite navigation with 'One-Step Voice Entry Destination', LED daytime running lights, an uprated instrument panel, cruise control with a speed limiter function, reverse parking sensors, front fog lights and wheel trims. Advanced functions like lane departure warning and Traffic Sign Recognition can also be specified.